On Pinterest I saw a vague recipe for mac and cheese in a mug, made in the microwave. The picture led to a random site, so I conducted a search. Because I love mac and cheese. The original recipe didn't include butter, but some people were complaining about the cheese not mixing with the milk well, and just causing a glob of cheese. Also, butter makes everything better. The original recipe also called for 1% milk, but that's just nasty. Go all out, my friends. 2% is the way to go (or whole milk, if you have it). It was good. I enjoyed it much more than my foray into the world of microwaved cake. You could make it a lot better if you used high quality cheese, but I didn't have any, and I am nothing if not lazy. The obligatory sad photo taken at night with bad lighting. Combine the pasta and water in a large mug or bowl (I recommend a bowl so it doesn't overflow). Microwave on high for two minutes, then stir. Repeat this for at least 2 more minutes (until your pasta is cooked), stirring at each 2-minute interval. My pasta cooked in 4 minutes. Remove it from the microwave. If there is excess water, drain it. Stir in the milk, butter, and cheese. Microwave for 30 seconds and stir. 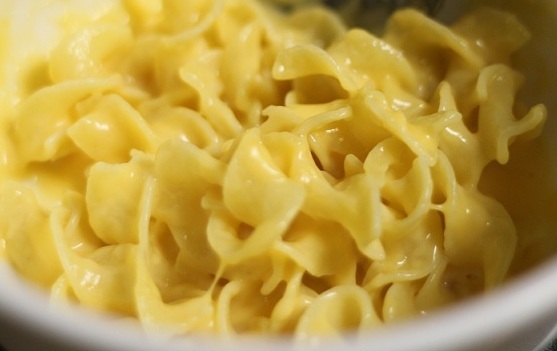 Microwave for another 30 seconds and stir the cheese sauce thoroughly into the pasta. Enjoy!